Shares of XPO Logistics (NYSE:XPO) plummeted last month as the logistics provider got dinged by bad news on two consecutive days in December. First, the company issued a profit warning, and shares tumbled the next day on a report from a short-seller. As a result, the stock finished the month down 25%, according to data from S&P Global Market Intelligence. As you can see from the chart below, shares were down more than 40% at one point, but the stock recovered some of those losses as investors saw opportunity in the sell-off. XPO was heading into December on a downward slide; the stock lost 15% in November after its third-quarter earnings report missed the mark due to a customer bankruptcy. 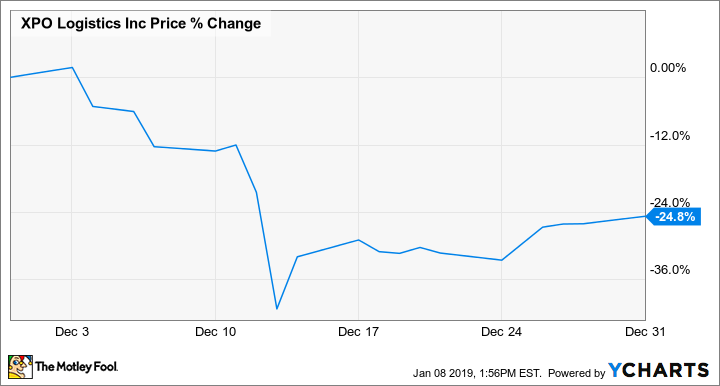 After the stock limped through the first week of December, falling on the negative momentum and the broader market weakness, investor concern mounted when the company said profit growth would be slower than expected in 2019. In a filing, XPO said adjusted EBITDA would grow 12% to 15% in 2019, down from prior projections of 15% to 18% that CEO Brad Jacobs gave in the company's third-quarter earnings report. XPO also forecast free cash flow of $650 million in the year, up just 4% from an expected $625 million in 2018. Management did not explain the guidance cut, but investors seemed to interpret it as a broader weakening in the shipping industry due to trade tensions with China and worries about continuing economic growth. The stock fell 10% on that news and crashed 26% the following day on a short-seller report from Spruce Point Capital. Spruce Point accused XPO of "financial irregularities" and covering up a growing "financial strain." XPO responded to the allegations, saying the report was "intentionally misleading" and had "significant inaccuracies," and added that its GAAP-based financial statements are audited annually and reviewed quarterly. The following day, XPO also announced a share repurchase authorization of $1 billion, helping to drive the stock's rebound and signaling that management believed the stock to be undervalued. While the profit warning is concerning for investors, they can take solace in XPO's cheap valuation as it's currently trading at a P/FCF ratio of less than 12 based on the projection of $650 million free cash flow, so slow growth seems priced in. The short-seller report comes at an odd time as the stock had already fallen sharply from its peak earlier this year of $116.27 a share. It would have made more sense for the firm to short the stock when it was actually expensive as it's now trading at half of what it used to be. Unless there's real financial fraud going on, which seems unlikely, investors should feel comfortable ignoring the short-seller attack, and consider taking advantage of the sell-off.